Are you ready to take control and make a difference? We are looking for a Senior Transactions Attorney for IBM Malaysia to provide legal advice and support to the IBM general business in IBM Malaysia & Brunei. Should you have minimum of 6 years of experience in legal practice in Malaysia, we invite you to apply for this role. Please contact me at muneem@my.ibm.com to find out more! Senior Aerospace Upeca Malaysia is urgently looking for following post : Procurement Exec | Skilled NC Programmer (open to other nationalities) | CNC Machinist | Storehand | QC Inspector | Temporary Clerk (3 months).To email your detailed CV to azliah.said@senior-aerospace.com.my , all above post are open only to Malaysian unless specified otherwise. Morning Semua, Saya perlukan welder perempuan. Nak 4 org. Ada yang berminat tak? Kalau ada email cv ke recruit@energyskills.com.my . Terima Kasih. SAP FICO job opening in Subang Jaya Immediate starter needed for 3 months contract Send your CV to hr@fbm.com.my if you are interested. 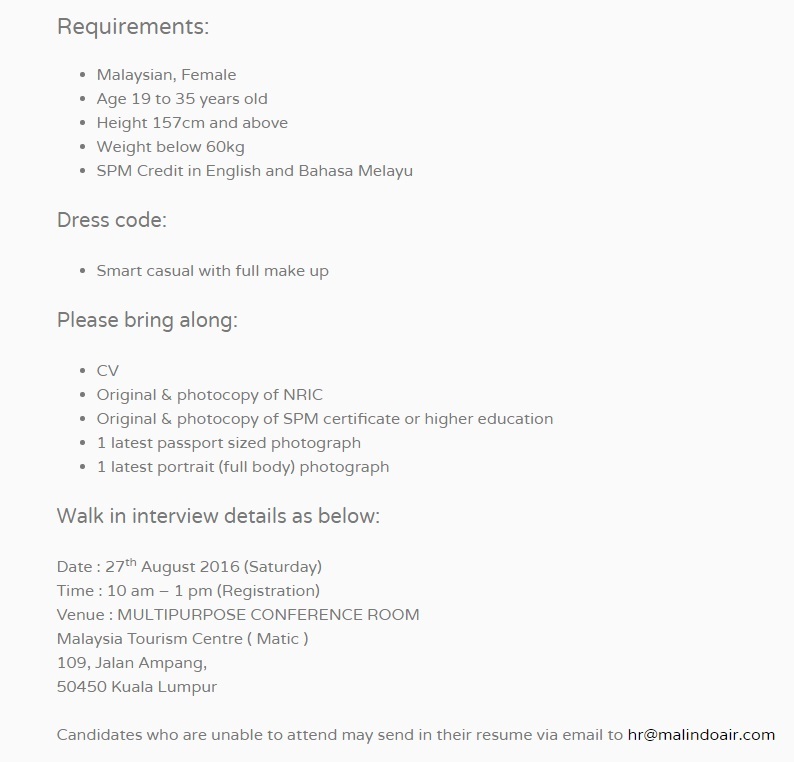 MMHE Sdn Bhd is looking for a dynamic candidates for the following positions:- 1. Manager Business Development (LNG) 2. Manager Customer Service 3. Technical Leader Production & Operations (Marine Repair Business Unit) 4. Project Superintendent (Marine Repair Business Unit) 5. Executive Cost Control 6. Executive Customer Service 7. Executive QA/QC 8. Executive Safety 9. Supervisor Safety 10. Rigger 11. Fitter 12. Lead, Maritime (Docking) Send in your resume to irena7790@gmail.com if you are interested. Thank you. Hiring! We are looking potential candidates to join us! 1. Accountant 2. Senior Account Executive 3. Planning Engineer 4. Procurement Executive 5. 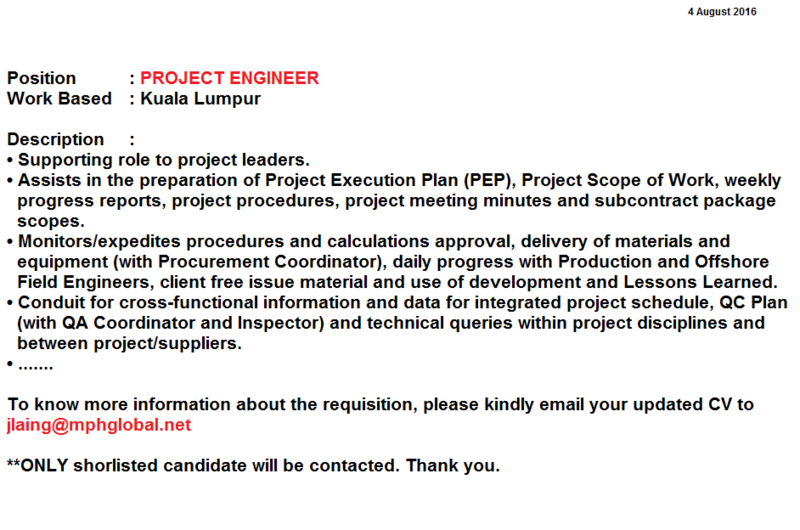 Project Engineer 6. Systems Engineer 7. QA/QC Engineer 8. Quality Manager 9. Sales Admin 10. 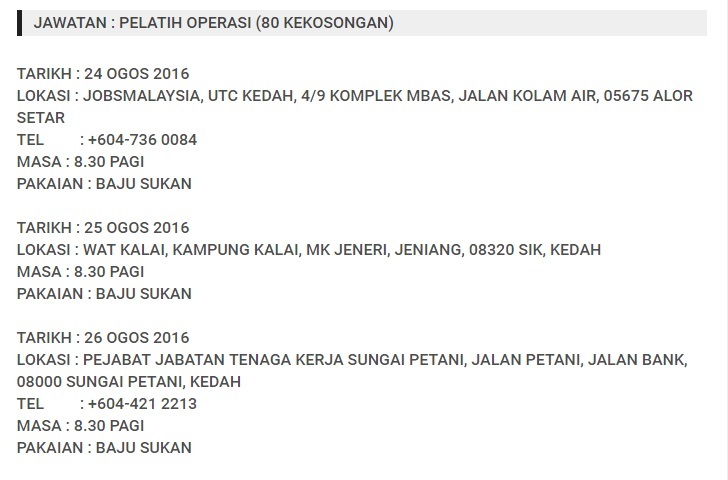 IT Engineer Above position only open for Malaysian. Welcome to send your updated resume with your expectation to shkek@evd.com.my Location: Putra Heights, Selangor. (Job opportunity in Oil & Gas) Please send your updated CV to micah.teo@epintl.com if you are the one we are looking for. Thanks. Hi all, Kurnia Alliance Marine & Offshore Sdn Bhd need: Mechanical inspectors, Structural/Welding inspectors Steel/Piping inspectors **All inspectors Need to have tanker experience** Please email it to farra@kurniaalliance.com Thank you and have a nice day. CUSTOMER SERVICE EXECUTIVE IMMEDIATELY HIRING!!! Hi everyone! Currently I am sourcing talent for Customer Service Executive (Inbound) position for one of our client based in Petaling Jaya, Selangor. We are looking for a candidate that willing to work on shift basis (24/7), excellent communication in English and can start immediately. Basic salary start from RM2,300+++ Interested applicants can PM me for more details or send your resume to raihan_azmin@kellyocg.com. *FRESH GRAD are highly welcome to apply! Hiring! Customer Service Executive (Logistics) in Shah Alam. Salary RM5500. Please email fiza.basir@hiresolutions.com.my - Deliver business class customer service via telephone. - Manage customer's expectations & display ownership for customer's requests. - Liaise with appropriate departments to resolve issues brought up by customers. - Coordinate Air / Sea, Import & Export Shipments. - Coordinate with Sales for pricing quotes to Customer. - Coordinate with Operations team to ensure timely & accurate movement of Customers cargo. Hi & Good Day, Anyone currently looking for job? Vacancy: Complex Executive Preferably Male. Knowledge in operations. If interested, kindly email to hidayah.jamil@kip.com.my Thank you. Good Day Guys! UMW Toyota is hiring for Executive Human Resource, Industrial Relations. Candidates need to have at least 1 or 2 years of experience in related field. prefer candidates with Law background. Kindly email your resume to heffihafizi@gmail.com Location Base Shah Alam. Many thanks! Looking for 20 person who have skills on DOCUMENTATION. ‼Expert on handling & prepare documents + IT BASIC. 📄💰Contract for 3 months. Basic Salary offered RM1,200.00 per month. Contract will be renew from time to time based on your performance & merit. VACANCY : Excellent Opportunity for Customer Service English Team at Agoda based in Kuala Lumpur, Malaysia. Please go through the link below for more information and to apply for the position or you can email me at rubini.sivagnanam@agoda.com. YOU HAVE WHAT IT TAKES! COME JOIN ME AT Agoda!!!!! OSR Inspector (Offshore Self-Regulation) Work Location: EnQuest office located at Menara Maxis, KLCC •Provision of a DOSH fully qualified OSR Inspector covering cranes and pressure vessels. 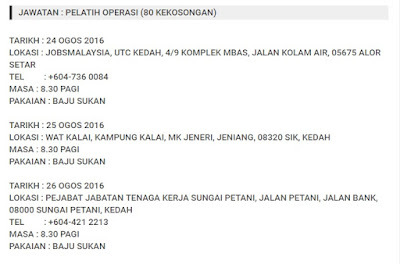 •Candidate shall be fully certified (to PETRONAS medical standards) for travel offshore. Dear All, We are looking candidates for 4 position as per attached , who available on the middle of September 2016 . Please email your CV to recruitment.local@epintl.com as soon as possible & shortlisted candidate will be contacted. Hi all, Kurnia Alliance Marine & Offshore Sdn Bhd need Offshore Pedestal Cranes & Crane Operators Crane Model to operate: - American Aero G20F - American Aero OM1600 - American Aero OM900 HD - Unit Mariner 5500 - FAVCO PC20 6/10K - FAVCO 200RL Please email your resume to farra@kurniaalliance.com Thank you and have a nice day. JOB VACANCIES: 1. .Net Developer (Senior & Junior), Subang Jaya / Putrajaya 2. Senior Software Developer (JAVA), Subang Jaya 3. Senior Software Tester (KL, Subang Jaya, Putrajaya) Malaysian. Degree in Computer Science or IT related. At least 2 years experience in related field. Possess own transport. Willing to travel. Interested? Kindly submit your resume to recruitment@heitech.com.my. Thank you. Assalamualaikum.. We are required welder for rapid pengerang package 3. Quantity welder as per below: 1. 6G Gtaw -20pax 2. 3g structure - 10pax Include accommodation. Please email welder pass/welding cert at saifulhizam@triglobeholding.com Please whatsapp at this no. 0197084314 for more info details. Tq. Estimation wqt date is 24/8/2016. QUANTITY SURVEYOR • Possess a degree in Quantity Surveying or relevant engineering degree/professional qualification. • Minimum five (5) years of working experience as Quantity Surveyor in fabrication/construction for onshore/offshore oil and gas facilities. • Should be able to prepare Change Order Proposals, payment Claims, etc. Interested, drop your CV to hr@brookedockyard.com.my. Please state the position applied on the subject in the email. Thank you. Yo Guys! UMW Toyota is looking for Executive Accounts- Accounts Payable & General Ledger under Accounts Finance Department. candidates with AP & GL experience is highly needed. also need somebody that have passionate in accouting field. kindly drop your resume to heffihafizi@gmail.com location base : Shah Alam HQ Thanks Guys! Untuk maklumat lanjut sila hubungi no diatas. - Degree in Civil Engineering. - 8 to 10 year's experience as Project/Site Manager on heavy civil construction projects, experience in bridge and road construction is preferred. - With competence in Construction Management skills, motivated, has strong leadership, able to encourage subordinates and other work groups to work as a team. - With knowledge of civil and structural codes and other associated codes use in the project, excellent technical background and skills in industrial environment. - Has excellent communication and interpersonal skills. - Ability to manage large teams, organise and prioritise work. - 5 year's experience as site engineer on heavy civil construction projects, experience in bridge and road construction is preferred. - A engineering degree is preferred. - 5 year's experience as project planning engineer on heavy civil construction projects, experience in bridge and road construction is preferred. - Proficient to set up and maintain the project schedule in the planning software system, Primavera. - Able to understand the sequence of construction activities and ensure that the manpower planning is sufficient at all levels of project execution. - Must be registered with DOSH. - Minimum 5 years working experience in construction. - Degree in Quantity Surveyor. - Minimum 5 years working experience in Quantity surveyor role. Interested candidates are invited to submit complete Curriculum Vitae stating personal particulars, job experience, qualifications and current and expected salary to hr@brookedockyard.com.my not later than 19th August 2016. Fresh graduates are encouraged to apply. Only shortlisted candidates will be called for interview. Working location: Limbang, Sarawak. Only shortlisted candidates will be notified. Thanks. Hi HSSE Professionals, I am looking for a candidate to fill an HSE vacancy based in Miri, Sarawak. 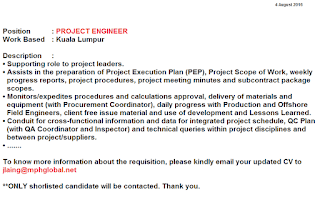 He or She must preferably be from Miri (candidates from other location within Malaysia will also be considered) and have adequate experience working in terminal maintenance, construction and modification. Familiar with PCSB requirements. If you are interested, please drop me an email and attach your latest CV: bls2778@gmail.com. Thank you. Actively hiring for 2 Supply Chain positions on behalf of a leading Chemical Manufacturer in Malaysia. 1. Supply Chain Operations Manager (experience handling both Import and Export shipment is a MUST) 2. Supply Planning Manager (look after both Singapore and Malaysia Planning team) Qualified candidates please send updated CV to jing.l@worldwide-rs.com Thank you!